The Record Update element is a close runner up to my most used element. I find that the majority of my Flows in some way or form are looking for a Record Update on the record that my Flow started from or another existing record. The cool part is you can go to any Object within your Flow, not just ones directly related to your starting record. For most Record Updates you will find that you are filtering on an Id that you used earlier in the Flow, but there are always exceptions! If you have not yet read the Record Create post, go read that for some tips and tricks that will be skipped in this post. Where is the Record Update element? 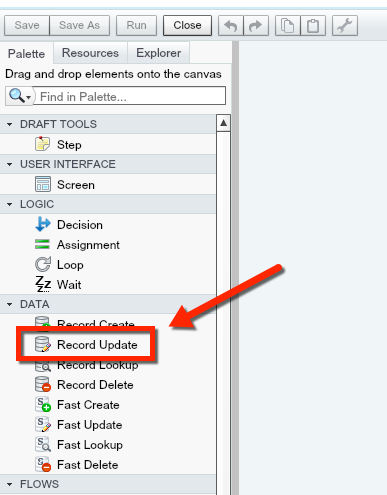 You can find the Record Update element under the DATA section of the Palette. Just like in the Record Create, we need to choose the Object that we are going to make an Update on. Make sure you type the name instead of scrolling down! Now that we have chosen the Object that we will search within, we need to setup a filter (or more) to grab the correct record. This is typically where we choose an Id as our filter, but in certain situations you might have to add some additional filters to make sure you update the correct record. You would add additional filters by clicking “Add Row”. As we set our Filter, we get to select the Operator that we will use. The values in the Operator depend on the type of field that you have selected. These values mirror what you see in Workflow Rules and Process Builder. 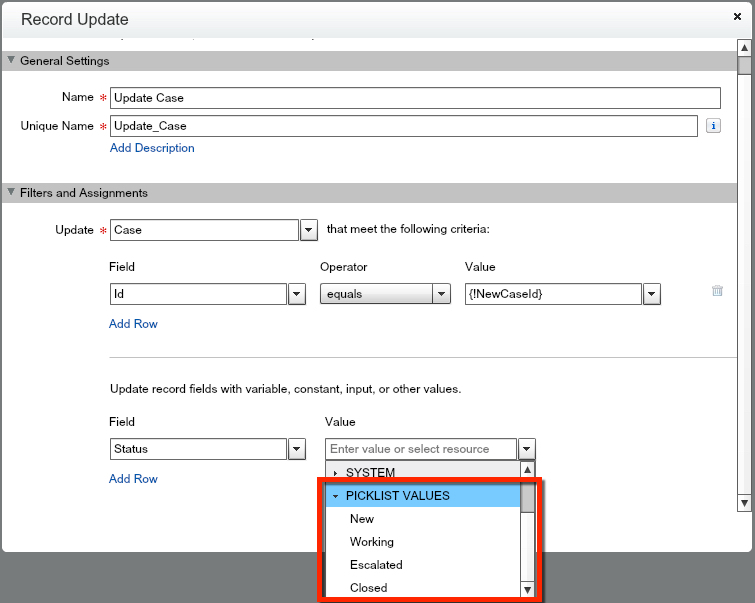 TIP: If your field is a Picklist, the Picklist Values are available in the Flow for you to select! Look just below the System values. Now that we have chosen the record on our Object that we will be updating, we get to choose what we will update. This is where I’ve seen some real creativity. Don’t limit yourself to in-the-box thinking! 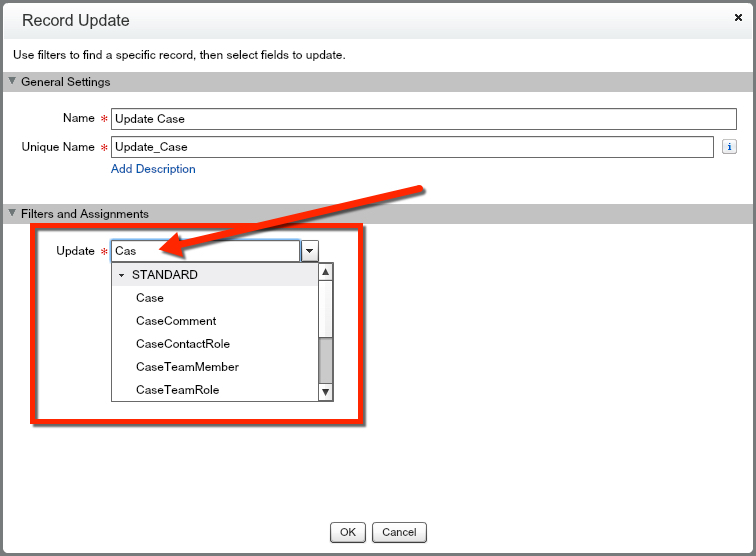 I am saying that hypocritically because my example is me updating a Status field on the Case to Closed. 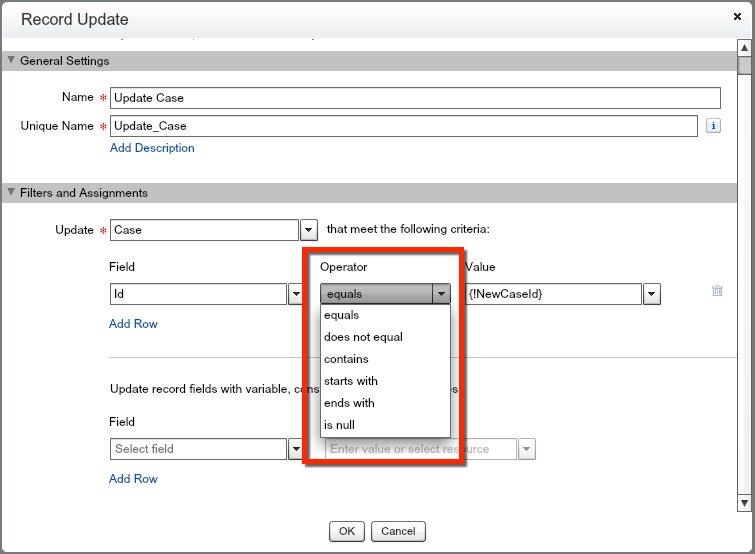 Notice, just like when creating a record, you have the ability to add more fields to your update by hitting “Add Row”. 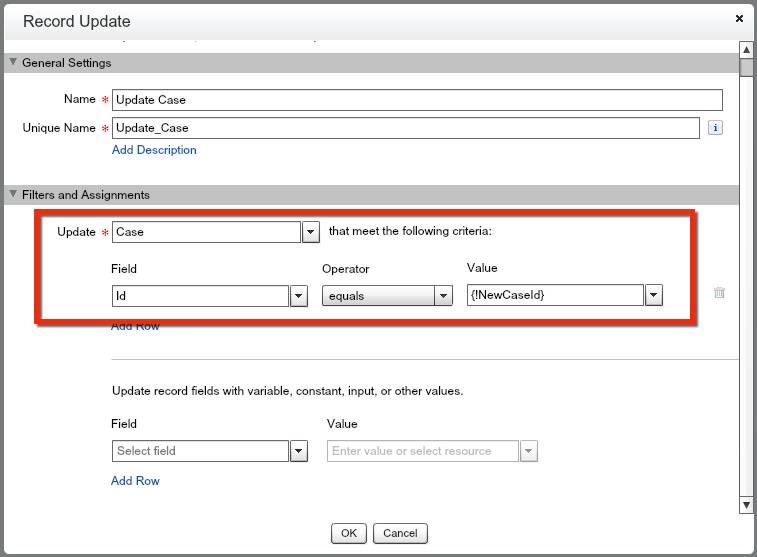 RECAP: Record Update elements let you update any record in Salesforce! There doesn’t have to be any relationship for you to make the update, you just need to know how you want to find it with your filters. Enjoy the power to update just about anything and becoming a Salesforce Superhero!